Gone are the days when one could leave the house with the doors unlocked and never give a second thought to a criminal walking in and stealing all your belongings. 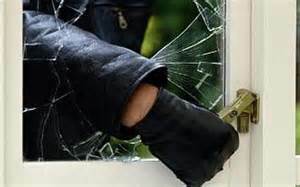 Today however the FBI reports a home burglary in this country occurs once every 10 seconds and in 2005 alone there were over 2 million burglaries. In response to these depressing statistics security companies have developed any number of high tech devices to thwart today’s scoundrels. I looked at a number of gadgets but one that caught my interest is the “Video Door Bell”. There are a number of manufacturers with various bells and whistles (no pun intended). I will discuss a few that I find offer the most features and benefits. One of the most popular is called “Ring” and combines a doorbell along with a high definition camera, a speaker and a microphone. What’s really cool about all of these devices is you can answer your door from anywhere in the world! Yes, that’s right. Thanks to wi-fi and smartphone apps a potential thief will not know that you are really in outer Mongolia and no where near home. You answer the bell and see the individual at your door and speak to them. The point is he’s been thwarted and your security is assured. The Ring sells for $199 which is pretty cheap for a device that offers so much peace of mind. “Ring” is sold at Amazon and most big box home improvement stores. And apartment dwellers are not being left out of these high tech security devices. 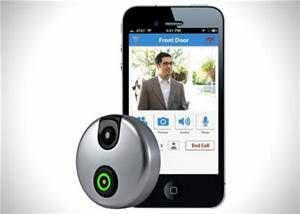 A device with the clever name of “Peeple Peephole” offers a system similar to Ring but mounts to an apartment’s peephole and allows you to monitor who is at your door through your connected smart phone via the internet. It’s simple to install and uses the existing peephole hardware. Peeple Peephole sells for $149 and is available at Amazon and most big box home improvement stores. If you’re in the market for even more security goodies in a compact package, take a look at “Canary”. This little beauty is compact but delivers big time all-inclusive home security. Its features include high definition video and audio, and is accessible from anywhere you might happen to be. It alerts if motion is detected, includes a 90-decibel siren that you can control remotely, monitors air quality and it sees in the dark! And it also backs up to the Cloud. It not only protects your house while you’re gone but can also monitor your pets and also connect to local 911 responders for help if needed. Canary is a bargain at $199 and again is available at Amazon and most big box home improvement stores. What you say, can’t afford these prices? Well “Alfred” is just what you’re looking for. It’s FREE!! It works with an older Android phone and turns the phone into a security camera with sound and is viewable from another smartphone or computer anytime, anywhere. Alfred also offers motion detection and push notifications as well as two-way talk along with the ability to take a snapshot at anytime. Do any of these gadgets actually work? Las Vegas Metro Police Department recently released a video of alleged burglars caught on camera on one of the doorbell cameras, trying to rob a home. Last December a woman was caught on a doorbell camera allegedly stealing packages in Miami. Shortly after police released photos of the woman she was arrested and charged with burglary theft.